It's all so simple if we want it to be. For almost a century we have been asking the same question in our cities. "How many cars can we move down a street?" It's time to change the question. If you ask "How many PEOPLE can we move down a street? ", the answer becomes much more modern and visionary. And simple. Oh, and cheaper. Let alone the fact that the model at the top can move 10 times more people down a street than the model at the bottom. When I travel with my Bicycle Urbanism by Design keynote, I often step on the toes of traffic engineers all around the world. Not all of them, however. I am always approached by engineers who are grateful that someone is questioning the unchanged nature of traffic engineering and the unmerited emphasis placed on it. I find it brilliant that individual traffic engineers in six different nations have all said the same thing to me: "We're problem solvers. But we're only ever asked to solve the same problem." This graphic is inspired by the wonderful conversations I've had around the world about my keynote. 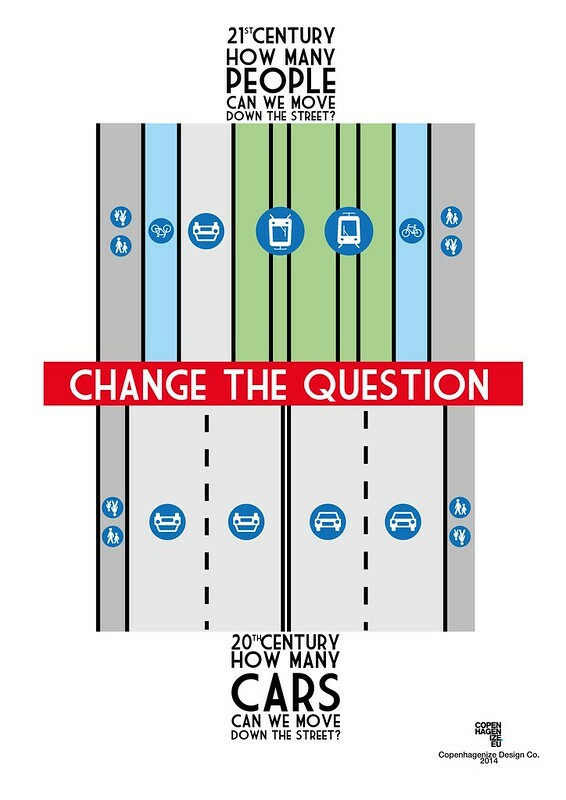 How many people we can move down the street is the New Question for liveability and transport in The Life-Sized City. With urbanisation on the rapid rise, we need to think big. Think modern. We need to travel Back to the Future for the solutions that will serve our growing populations best. Cycle tracks. Trams. Wider sidewalks. It's all right there for the taking if we dare to take it.